I left my Air Force and moved to Evansville, Indiana to live with my mother and my son, Gizmo (the dog). Retired life had been stable, smooth, secure, and very boring! I missed having a challenge but was firmly entrenched in gluttony and staleness. I liked the respect I received after I mentioned, in introducing myself, that I was retired from Air Force Intelligence. I had to start somewhere--it was my only identity. Once I grew my hair long and showed up with my cute Yorkie and my mother whom I was living with, it was hard to get anyone to take me seriously. It made me feel sad but dangerous at the same time. I looked like a punk out of high-school. And why shouldn't a punk out of high school be treated as well as an Air Force retiree if he addresses with respect and speaks with clarity and intellect? I don't know, so I bought a bullhorn. I tried being active. I participated in my church activities, joined neighbors (and Mom) to fight a developer who wanted a 1200-bed apartment complex behind our back yard, sold my father's things on ebay from January to June and grossed $23,000+ to split with my siblings, becoming an Ebay power-seller, and I became the secretary of my church group, putting out a much requested bi-monthly newsletter. I became known as the biker guy (surprise!) because I rode my bicycle to church a few times. Some people are just too easy to impress. From July to December I'd been interviewed by the local newspaper, two television stations, had three letters-to-the-editor published (Mom's friends usually voiced protests over my opinions), probably a dozen or more anonymous comments published in the Opinion section, and the battle with that developer was in local news and on television. Let's say I received a lot of face time. My thoughts would always get more attention than I would. But it was just kid's play--a small voice crying in the basement for attention, which is where I spent most of my time. Others were out living life while I commented on a life unlived. In November a killer tornado passed within six miles of the house and killed 25 people in nearby Newburgh, all the while I slept in bed. The next day I pondered my good fortune at having dodged this bullet and wondered--if you don't run after life, will death catch up with you? Far better to die for something than to live for nothing. 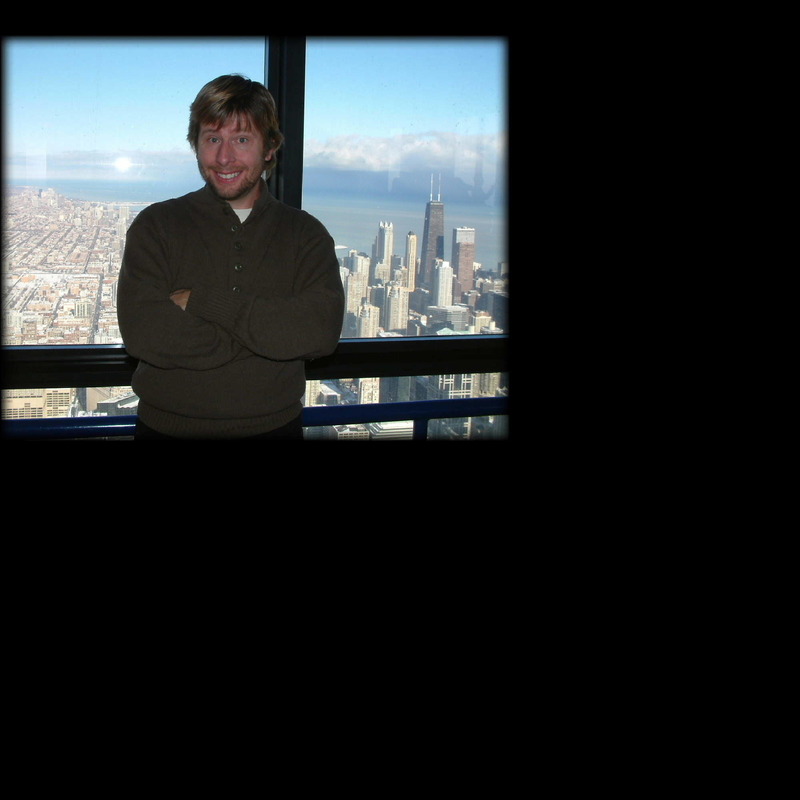 then I asked my very special friend Amy if she wanted to go to Chicago with me and get a picture of me standing at the top of the Sears Tower. I was going to get high one way or another. She said,"Uhhh, okay". And that's what we did! I just wanted to show that, although it's great to build your own empire, it's almost as fulfilling to climb to the top of someone else's empire and smile.